I could not have been more fortunate to have experienced an early childhood Christmas in the 1960's. "Pure joy" are the words that spring to mind when I recall the pristine beauty and all encompassing Christmas spirit that enveloped the lives of all the children in my Orange County neighborhood during those days. As hard as it is to conceive now, we actually sang Christmas carols in our public schools back in those days. Even traditionally sacred songs such as Silent Night and The First Noel were a part of the curriculum. Although I'm a progressive, I've found myself occasionally nodding in agreement in recent years when the Fox News types complain about the politically correct "War on Christmas." "Defending Christmas" is a popular topic every December for Bill O'Reilly. Truth be told, I really miss those old days sometimes. The Christmas season, to my innocent, sparkling eyes back then, was so pure and beautiful. And yet...and yet...in really looking at this issue, I must use my head as well as my heart. was a very, very, very, very white existence. I didn't even see my first African-American human being in person until I was almost 10. He was a friend of our fathers who came to visit. His skin was very, very dark. I was curious to see what his skin felt like, so I asked him if I could touch his arm. He kindly agreed. There were very few immigrants in Orange County back then from Asia or the Middle East, and only a tiny sprinkling of Jews. We were white, white, whitey white, Christian white. America in 2013, needless to say, is a very different place than in the 1960's. Now, you can argue about the topic of immigration and how we got to be the way we are, but the fact is that the Christian white extreme majority that we enjoyed in the 1960's is pretty much gone. Fox News likes to complain about how our government and schools have pretty much drained the original Christmas message out of any annual celebrations. But the "Happy Holidays" thing started with businesses, not with government. Businesses realized that if you want to attract ALL customers during the holidays, and not just white Christian ones, you'd best cast a wide net. 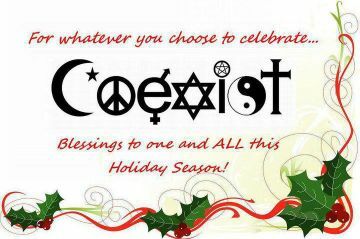 Christmas purists might cringe at this very politically correct holiday card which some businesses send out. But if you think about it, if you have customers of every race and religion, a card like this is probably a pretty smart business model. Fox News, ground zero of the "War on Christmas" creed, got busted recently. You see, Fox News IS, of course, first and foremost a BUSINESS. With employees that they presumably appreciate and would like to keep. 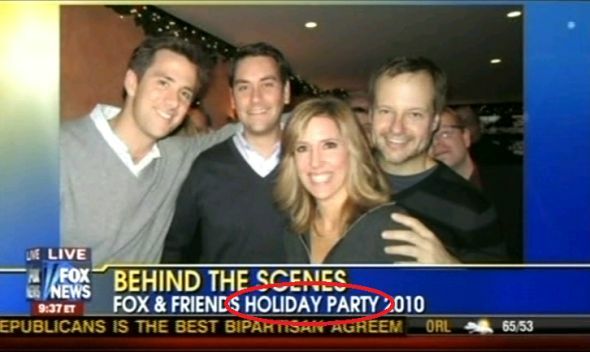 A Fox News employee inadvertently admitted on the air that the Fox and Friends Christmas Party was actually a HOLIDAY party, as the graphic above shows. Whoopsie. You see, Fox News is in the middle of New York City, and without doubt several of their employees are Jewish, etc. The slip-up above shows how political correctness regarding Christmas in America started in, and mostly thrives in -- the business community. With good reason. It's just good business. Now the War on Christmas has spread to schools and governments, and to a certain extent, I agree with and understand the political correct movement. 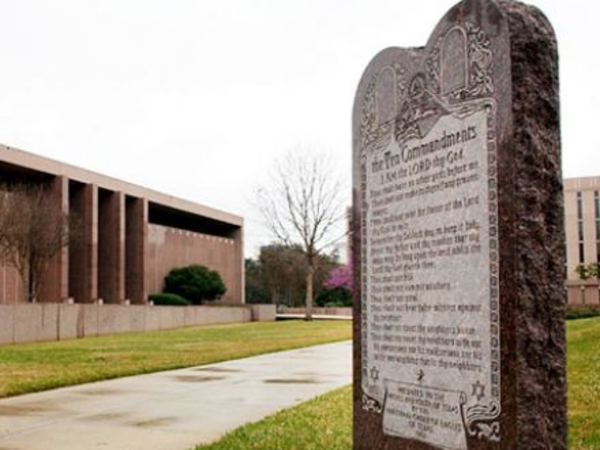 Is it really morally right to have a monument to Christian Bible verses in front of a government building that is supposed to represent all of us, of every religious (or non-religious) background equally? So, here we are, in 2013. Bill O'Reilly not withstanding, Christmas seems to be thriving. It's alive and well. And of course, noone is stopping us from going Full Nativity Scene in our homes and churches. We are free to celebrate in whatever way we choose amongst our family and friends. then who am I to argue? As with most controversial issues, in my opinion the middle way is the best. I don't think City Hall needs to have a Nativity scene splayed on the grass. But I do wish public schools could feel free to lead their children in a beautiful Christmas carol like "Silent Night" that encompasses our best traditions and encourages feelings of togetherness, peacefulness and awe. Thanksgiving is about family, and learning to live together and accept each other. This is a lifelong process, that changes and morphs as the shape and look of our family and friends evolve. Our family has evolved and changed a bit since the photos above were taken. We'd best do our darndest to roll with the changes, even if we mourn the old days. 2013 was our first holiday back in SoCal after 2 years at sea. Family and friends lovingly adopted and cared for our two cats, Buddy and Smudge, while we were away. The first cat we reclaimed upon our return was Buddy. As this photo shows, he's been absolutely basking in the singular love and attention that he receives from Dad since we've been back. He's grown a bit spoiled. This would not last long. Over Thanksgiving we helped my Mom move out of her charming little cottage and into my sister JoAnna's home. Mom has been caring for Smudge during our travels, so it was time to bring him on home as well. Smudge has grown accustomed to life in Mom's cottage. He kind of freaked out when he peered out the window and saw us carrying the kitty moving box. We endured two sleepless nights of aggressive feline hissing, growling and crying...but I knew that eventually they would both realize that they are brothers. They are sort of stuck with each other. Like a human family, they did not choose each other, but if they want to be relatively happy they'd best come to accept each other. They're not exactly cuddling and playing with each other yet, but the hissing has stopped, and they now sleep on the same bed. Family...what are you gonna do? So, another Thanksgiving comes and goes. Life goes on. Nothing else to do but break out the Christmas decorations...the biggest holiday of all is just around the corner...take a deep breath and dive in!